From left, Finance Secretary Joel Jack, FCB Group CEO Karen Darbasie and FCB's Head, Brand Marketing Larry Olton at the launch of First Citizens Bank Girls Festival inaugural Girls First programme last Friday at the Magdalena Grand Beach and Golf Resort in Lowlands. Over 300 teenagers will embark on a voyage of sisterhood on November 18, as First Citizens Bank begins its inaugural First Citizens Bank Girls’ Festival, entitled ‘Girls First’. At a media launch at the Kali’na Restaurant of the Magdalena Grand Beach and Golf Resort on Friday, FCB Group Chief Executive Officer (CEO) Karen Darbasie said the Festival wasa about engendering a spirit of sisterhood, resilience and high self-esteem amongst young girls throughout Trinidad and Tobago. 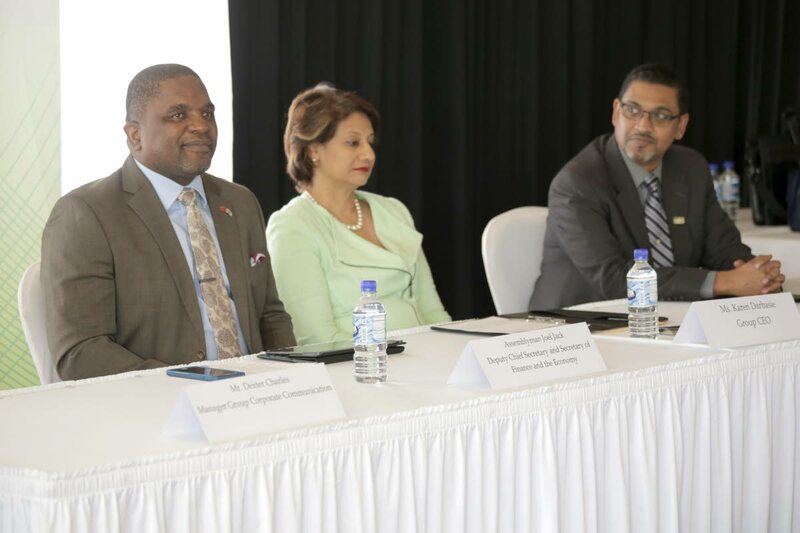 “We have five festivals carded, the first of which will take place in Tobago with four similar conferences in Trinidad. Each conference is expected to attract at least 300 young women and would provide them with age appropriate content consisting of three main elements; the conference, a career fair and an exposition,” Darbasie said. The festival will feature sessions such as career and professional development, the power of self-esteem, personal safety, health and wellness as well as a Zumba party and will focus on girls aged 13-18. Finance Secretary Joel Jack commended the bank’s project, noting that education goes beyond schooling. rights. We all need to get involved, we all need to play our part as investing in girls’ education is investing in a nation. We as parents, as a wider community, we all need to work in tandem, we must all work collectively. “Effective education is holistic because it is about the preparation and the agencies preparing a future generation to face life’s challenges and to make informed decision. Unlocking the greatness of our young girls is a transformative step in their developmental journey,” Jack said. Reply to "Teenagers on voyage of sisterhood"